Everlast Sports Nutrition developed their Proline of supplements which includes NO NitroPlex, NitroPlex-6, HyperPlex protein bars, Hyperplex protein powder, and also Thermo Triplex for weight loss. Both NO NitroPlex and NitroPlex-6 are pre-workout supplements that's developed to help enhance strength, power, and endurance during workouts, while HyperPlex Protein Powder and Bars are developed to be sources of high quality protein. Disclosure: I was recently contacted by a marketing rep for Everlast supplements, and was offered samples for all of these for reviews on our site here. For samples of the products received, I agreed to test them out and write reviews on them. However, no payment or other forms of compensation were received in any way, and you can be sure that this review, like all other reviews on the site, are free from bias and free from manufacturer influence. I received two 2.59lb tubs of the HyperPlex Protein Chocolate and Vanilla flavors. It is widely known and accepted that whey protein provides numerous health benefits. You should not be surprised to hear that whey protein improves immune functions by increasing glutathione levels, helps with weight loss, helps increase lean muscle mass, speeds up recovery after exercising , stimulates muscle protein synthesis, and more. There are literally hundreds (if not thousands) of studies that you can easily find demonstrating the many stated benefits of whey protein. Australian Technology Network Centre for Metabolic Fitness and Nutritional Physiology Research Centre, University of South Australia, Adelaide, South Australia, Australia. As mentioned earlier, Everlast HyperPlex protein also contain one very interesting ingredient called Aminogen. Aminogen is an important ingredient in high quality protein supplements since it has been found to help increase amino acid levels and also boost nitrogen retention. Currently, the recommended daily protein intake for building lean muscle mass is about 3 times more than the recommended daily intake for the average person. However, some studies have suggested that the amount of whey protein absorbed in one sitting may only be a small amount (one study suggested 15g). 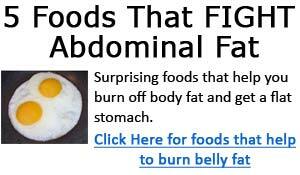 Factors affecting this were attributed to incomplete digestion. One study was conducted to determine if Aminogen helps to increase absorption rate of whey protein. In this study, 2 groups of health males subjects participated. After an overnight fast, they were given 50g of whey protein, and 9 days later, the same groups were given 50g of whey protein along with either 2.5g or 5g of Aminogen. Blood samples were taken 0, 0.5, 1, 2, 3, 3.5, and 4 hours for amino acid analysis. Their analysis found that total serum amino acid levels were significantly higher in the Aminogen groups compared to control. The study concluded that Aminogen increased the absorption rate of whey protein. Below is a graph showing the serum amino acid levels plotted against time intervals. 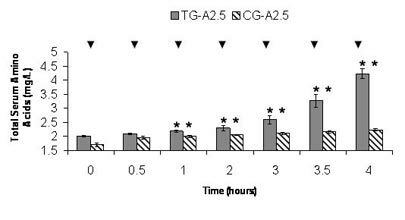 Dark gray bars are amino levels from using Aminogen (TG), and the lined bars (CG) are amino levels of the control group. The graph is reprinted from: An open label study to determine the effects of an oral proteolytic enzyme system on whey protein concentrate metabolism in healthy males J Int Soc Sports Nutr. 2008;5:10-10. However, one thing I need to mention here is that HyperPlex protein contains just 100mg if Aminogen per serving, whereas the studies used doses of 2.5g and 5g. As mentioned earlier, I received two tubs of HyperPlex Protein - a chocolate flavor and a vanilla flavor. Both flavors were quite good, but I have to say I enjoyed the chocolate more than the vanilla. HyperPlex has a slightly thicker texture compared to most other protein supplements; however, it comes out very smooth, and the powder mixes easily. A few quick shakes in a shaker and it's good to go. Another big plus is that it does not foam. 2. J Int Soc Sports Nutr. 2008 Jul 24;5:10. An open label study to determine the effects of an oral proteolytic enzyme system on whey protein concentrate metabolism in healthy males. Oben J, Kothari SC, Anderson ML.